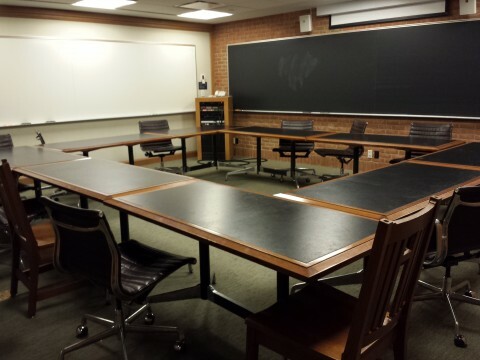 Rooms L01-A/B and L06-A/B can be booked by Yale Library staff and Yale students for classes, workshops, meetings and other group work. Note: Room reservations will not be available after May 20, 2019. Seats 28 students or can be partitioned into two rooms, with each seating 14 students. To make the room larger or smaller, request the partition key from the Bass Circulation Desk. There are not student computers in L01 A/B. Tables and chairs may be reconfigured to accommodate needs. Note: There is a presenter podium and computer only the L01A side, which is fitted with a Sympodium and connected to its own ceiling-mounted data projector. There is a desktop PC at each student seat. There are two lecterns (one on each side of the room, A and B), each fitted with a Sympodium and connected to its own ceiling-mounted data projector. Note: When classes are in session, only Yale Library staff can book L01-A/B and L06-A/B between the hours of 8:30am and 5pm on weekdays. Students and other Yale affiliates may book these rooms after 5pm on weekdays, on weekends, and at any time when classes are not in session (i.e. : Reading Week). Any request to book these rooms Monday through Friday between 8:30 AM - 5:00 PM by anyone other than a Yale Library staff member will be turned down. If you need any technical assistance with the technology in these rooms, please contact AV Classroom Services at 2-2650.